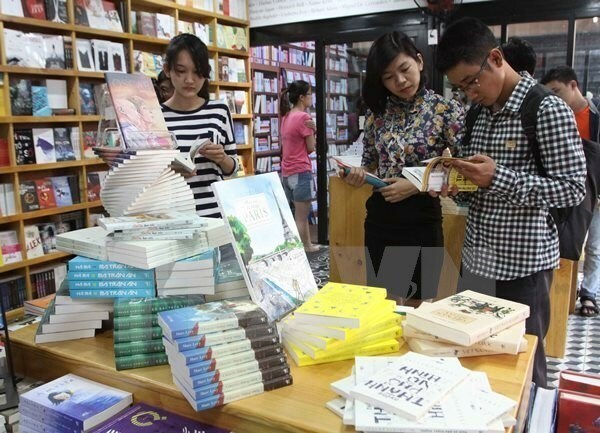 Hanoi (VNA) – A host of events are set to run in Hanoi from April 17-22 to celebrate the sixth Vietnam Book Day (April 21), Nguyen Ngoc Bao, Deputy Director of the Department of Publishing, Printing, and Issuing, told reporters on April 12. The series will kick off with a seminar on the promotion of reading in communities scheduled for April 17. The next day, a national conference will take place to review the five-year implementation of the PM’s 2014 decision to designate April 21 as the Vietnam Book Day. From April 18 to 22, a book festival will thrill book lovers in the capital. As of April 12, 90 publishing houses and distribution companies have registered to join the festival. They plan to run over 100 stalls, launch books, and hold exchanges between authors and readers. Meanwhile, the organiser of the event will run a display of books made from different materials over time, as well as an introduction of Vietnam Book Day activities nationwide in years, among others. The date will also be marked at the National Library of Vietnam and at community-based libraries across the country.